Certain automobiles bring with them an instantaneous image, wrong or right: You can guess that the driver of a bright yellow Corvette may have been in the Air Force in the 1980s, while anyone who’s ever bought a 6-Series BMW is clearly either an orthodontist or a plastic surgeon. 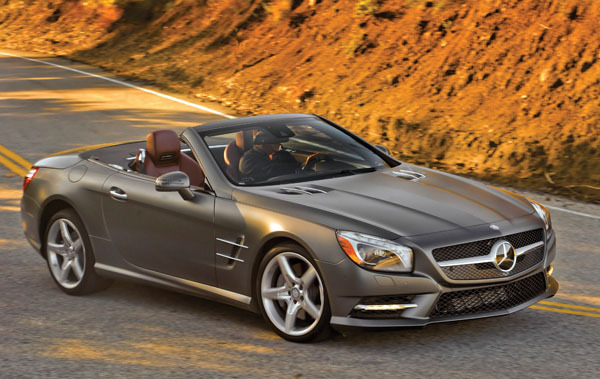 The all-new, 60th-anniversary version of the iconic Mercedes-Benz SL roadster too is a little pre-loaded with a pretty image-heavy series of pre-expectations about the kind of folks who’ll be driving them, mostly in the summer, largely to be valet parked at golf courses. And with a price tag that skirts the $120,000 range for an automobile with the same level of practicality as a Mazda Miata, it’s clearly a top choice for a noble few. I was very lucky to drive the new SL550 back-to-back with the equally beautiful but polarizing Porsche Panamera and I’ll be darned if the Mercedes wasn’t faster and sleeker. It doesn’t have quite the race track-tuned intensity (or the rear seat) of the similarly priced Porsche, but … again, there’s a certain market out there seeking the best in two-door, hard-top convertible luxury, and the Mercedes is going to have its fans. This newest SL, the sixth generation of the car, has both grown and shrunk in important ways: It’s two inches longer and wider than the old model yet it lost 200 pounds in the process, thanks to tons of aluminum in the design. Credit the supercar-level SLS for inspiring the update in design and setting the benchmark for much of the SL’s retro-futuristic interior and range of technology, as well. All of that aluminum stiffening creates an automobile that can be more than a tad jarring on less-than-perfect urban pavement, with the painfully wide optional 19-inch high-performance tires giving you great intimacy with the road. Put that connection to work in a racier setting and it’s remarkable, especially as there doesn’t seem to be much to slow the ferocity of that loud, explosively responsive engine and intuitive seven-speed automatic transmission. A simple tap, even at higher-than-highway speeds, consistently summons more boost. In summery round-the-town cruising, SL’s tricked-out, fully-automatic roof is probably the best mechanical system I’ve ever seen – folding effortlessly into the trunk like a beautiful metallic insect. And it’s got the hilariously titled Magic Sky Control, a glass sunroof panel that will electronically darken when you want it to do so, which is just super-freakin’ cool. Those less-snowbound Germans have also designated the SL550 a winter-worthy machine, with heated seats and a fancy neck-level heating system. Up here, it’s probably not going to work as a substitute to a GL SUV in the winter, but the summery positives are certainly many, including ventilated seats, as well. In a mild nod to increased efficiency, the SL is standard equipped with an automatic stop-start system which kills the engine while stopped in traffic. I preferred to leave that particular doodad off and cultivate the full, ridiculous off-the-line whomp the car can deliver. It’s certainly a charming beast on the inside, with real walnut trim, illuminated door sills and a mix of details including a 1950s science fiction-inspired analog clock and instrument gauges, an optional wooden steering wheel and improved, hand-friendly controls for the navigation system. The innovative, standard-issue harmon-kardon stereo system has the subwoofer speakers mounted in the firewall of the engine so the sound can be astoundingly intense, when desired. Not satisfied with a paltry 429 horses? SL’s upgraded AMG sisters take the same package and outfit it with either a 590-horsepower 5.4-liter V8 or a completely insane 6.0-liter twin turbo V12, making 738 horsepower. Quite inconceivable, really.